Alternative games ( basketball, comba, twister, small soccer, ….). June per weeks: 06/ 26 to 06/06. July per weeks: 07/03 to 07/ 07; 07/ 10 to 07/ 14; 07/ 17 to 07/21; 07/24 to 07/28. August per weeks: 07/ 31 to 08/04; 08/21 to 08/25. September per weeks: 08/28 to 09/01; 09/04 to 09/ 08. 10:15 Riding, installation viewing, practical instructions in horse hygiene, tacking up and equipment use, contact with the horse. 15:45 to 16h Pick up and end of the day. 09:15 Cleaninng the horse, tacking up and equipment use, contact with the horse……. 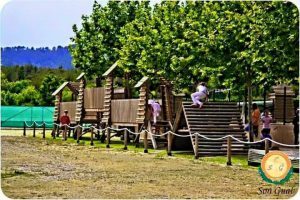 11:15 Riding horse, games, adventure park………. 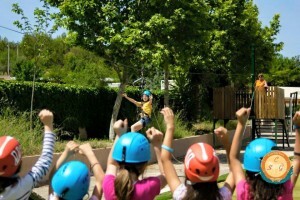 15:00 Adventure games, games , …..
15:45to16h Pick up and end of the day. 15:30 End of course and delivery of ” diplomas “. This program for the children is orientative. We recommended puntuallity. At 4pm we close our center. 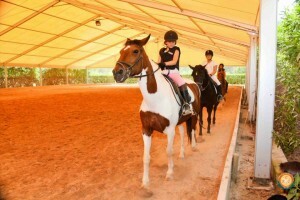 For riding horse : ridding horse clothes. If you don`t have the material for ridding horse the good clothes for ride a horse are: long pants with sports shoes. For the other activities: comfortable clothes with sports shoes. 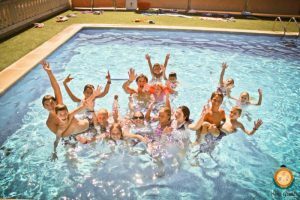 PRICES OF SUMMER CAMP 2016. In the price includes snack, lunch and all the activities. – Price for each week : 165€. – Price for two weeks: 300€. -Price for two weeks: 300€. – Price for each week: 165€. FOR BROTHERS AND SISTERS WILL MAKE 5% OF DISCOUNT FOR EACH WEEK. Reservations can be made by sending us the correctly filled out enrollment file. Within 5 days, the complete price of the booked course must be paid. Reservations will automatically be cancelled should this not be done. Should you want to cancel a reservation, please do so at least 20 days before the booked activity commences. If we don´t have at least a week children , we will cancel the week and you have the possibility to change for another week. If cancelled later no refunds will be given, and the right for claim or indemnity will be lost. NOTE: Given that all activities include horses, the tetanus vaccination is recommended. One time that you send to us the inscription , we will replay you the same day or as much in 5 days. If you don´t recibe any answered, please contact with us 608532096 or 971609769.